Synthetic peptide corresponding to Human NF-kB p65 aa 300-400 (internal sequence) conjugated to Keyhole Limpet Haemocyanin (KLH). 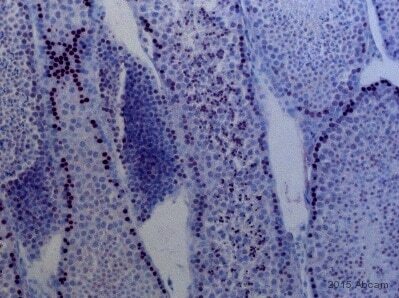 This antibody gave a positive signal in Rat lung tissue lysate. Our Abpromise guarantee covers the use of ab19870 in the following tested applications. IP Use a concentration of 2.5 µg/ml. ICC Use at an assay dependent dilution. In ICC/IF ab19870 recognizes various acetylated nuclear protein(s), as the signal is also observed in control cells; the signal in ICC is HDACi-dependent. The p65 band runs higher in this blot because the protein contains a myc-tag. Lysates/proteins at 60 µg per lane. Rabbit polyclonal to NF-kB p65 (acetyl K310) (ab19870; 2.5µg/ml) in 1% non-fat milk TBS-T incubated for 3h at room temperature. Exposure time: 75 min normal ECL. This Dot blot demonstrates that ab19870 recognized upto 10ng of purified peptide on a PVDF membrane. Western Blot with ab19870 after p65 Immunoprecipitation: rabbit polyclonal to NF-kB p65 (acetyl K310) (ab19870; 2.5µg/ml) in 1% non-fat milk TBS-T incubated for 3 hours at room temperature. Exposure time: 1 min normal ECL. Tested samples: nuclear extracts (180 µg) of immortalized p65-/- mouse cells, complemented with the empty vector (pRRL), wild-type p65 (Wt) and non-acetylatable K310 (K310R). The samples tested were treated with deacetylase inhibitors HDACi (TSA + Nicotinamide) and TNF-alpha. The samples were immunoprecipitated with 2µg of alpha-p65 and subsequently analysed by Western blot with Rabbit polyclonal to NF-kB p65 (acetyl K310) (ab19870). Predicted band size = 65kDa, Observed band size = 75kDa. The p65 band runs higher in this SDS-PAGE blot as it contains a myc-tag. ab19870 recognizes Rabbit polyclonal to NF-kB p65 (acetyl K310) specifically at ~75kDa (indicated by the arrow) is this SDS-PAGE blot. The p65 band runs higher than 65kDa in this SDS-PAGE blot as it contains a myc-tag. 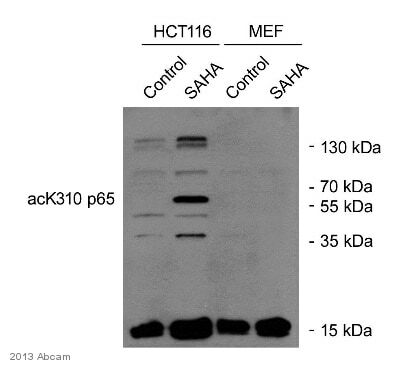 We are sure that the band at ~75kDa is p65 since p65 specific antibodies detect the same band in IP and WB and there is no signal in the p65 knock-out cell line with ab19870. A number of additonal bands are recognized by ab19870 when tested with endogenous p65 from whole cell extracts, we do not know the identity of these bands. Observed band size: 72 kDa why is the actual band size different from the predicted? Additional bands at: 15 kDa. We are unsure as to the identity of these extra bands. Publishing research using ab19870? Please let us know so that we can cite the reference in this datasheet.